The Banyan Tree are renowned for many things, from their rooftop bars to their spas; and it was their spa that we tried recently. Kuala Lumpur isn’t quite in the same league as Bangkok or Bali when it comes to spas, but with the opening of this one, the stakes have certainly risen. 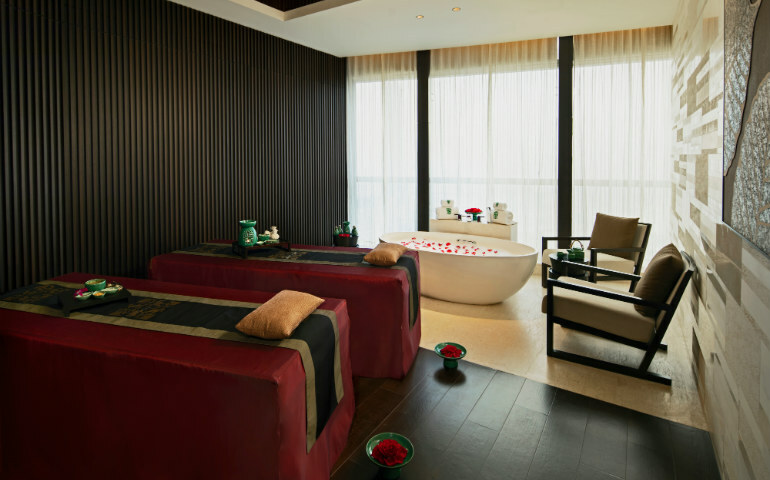 Put aside a few hours and indulge in one of their signature treatments – Malaysian Bliss, Royal Banyan and the Master Therapist Experience. These last for approximately two-and-a-half hours where you will be pampered literally from head to toe. There are also shorter treatments that are no less indulgent and are part of their comprehensive Time-Honoured Traditions range. These are based on traditional Indian / Chinese / Thai / Indonesian therapies and their respective healing herbs and ingredients. The Banyan Tree Spa prides itself on its use of luxurious aromatic oils made from herbs and spices guaranteed to heal and relax. All treatments begin with foot bath and 30 minutes of Calm Time where refreshments are also served. This is a lovely start, particularly if you’ve had a tough day! I experienced the Malaysian Bliss package, comprising a turmeric honey cleanse, massage, goat milk face mask, scalp massage and a jasmine green tea bath. A spa can be judged on several aspects – décor, products used, therapies offered and the most important, how good the therapists are. The Banyan Tree Spa make it a point to have skilled therapists who make you feel utterly at ease, and this makes all the difference. You can also opt for individual treatments including different types of massages (Thai, Balinese, deep tissue), facials and body scrubs for both men and women. Prices befit the treatments, service and ambience, and there are also off-peak prices which are pretty good value. This is the spa to go to for a well-deserved treat, to spend an afternoon with girlfriends or partner (there’s a couple’s spa treatment room), and would make for a fabulous gift. The truth is in the way one feels after a spa session and I must say even battling traffic on a Friday evening did little to dampen how relaxed I felt.